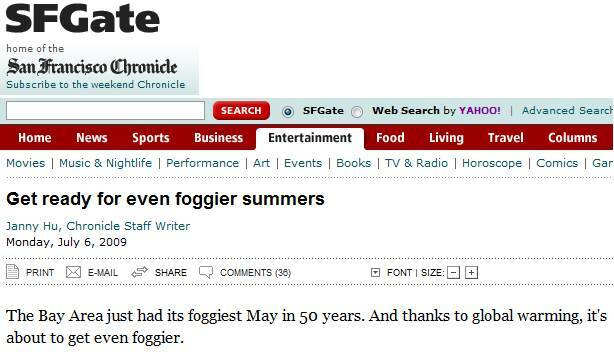 Studies show that global warming will increase the coastal fog. Studies also show that global warming has decreased coastal fog. Global warming causes everything. The studies refer to “the temperature difference between the coast and interior”. The following two figures show the average May / June / July temperature for coastal Santa Cruz, which is a foggy area (top) and the non-foggy Merced Municipal airport in the interior Central Valley approximately due east of Santa Cruz (bottom). 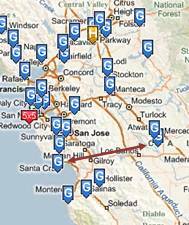 The map indicates the relative position of Santa Cruz and Merced. The following figure compares the same data as in the above two graphs with Merced changed to red and Santa Cruz in blue. There is virtually no difference until after 2000. 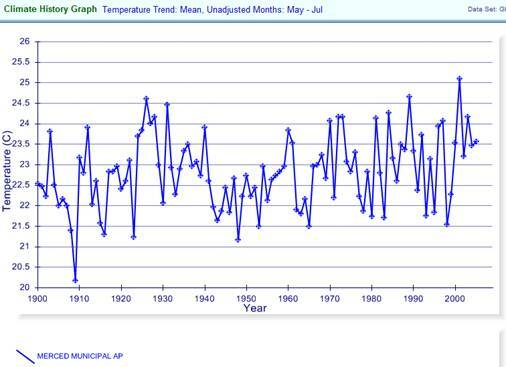 Except for the year 2000 at Merced, recent warming was similar to the 1930s. The warmest summer in Santa Cruz was 1992. More fog? Less Fog? More smoke and mirrors. The Telegraph article shown above reports a new study to be published in the Proceedings of the National Academy of Sciences, and also described in Science Daily [http://www.sciencedaily.com/releases/2010/02/100215174117.htm], which stated: “evaluated the data from airports along the northern California coast and found two airports -- Arcata and Monterey -- that had consistent fog records going back to 1951.” Unfortunately they don’t understand the climate of the US – any data set that does not go as far back as 1930 will provide a misleading analysis. The article states: “Since 1901, the average number of hours of fog along the coast in summer has dropped from 56 percent to 42 percent, which is a loss of about three hours per day … the change could affect not only the redwoods, but the entire redwood ecosystem” Alarm! Alarm! Nothing has ever changed before, in the thousands of years that redwoods have been there! 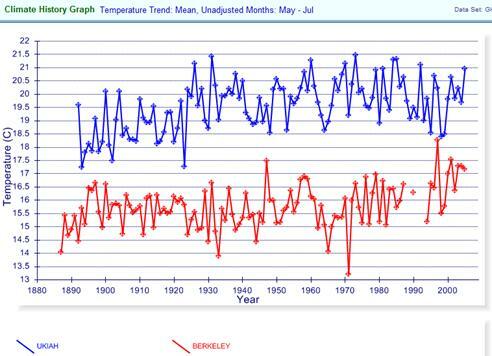 It is not clear why they compare Ukiah and Berkeley – the annual average May / June / July temperature is shown below along with a map indicating the relative position. 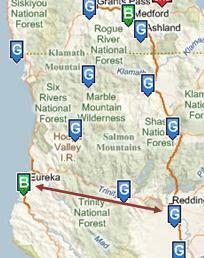 More reasonable comparisons would be based on stations located on the coast / inland from each other, such as Santa Cruz / Merced shown previously, or Eureka / Redding as shown below. 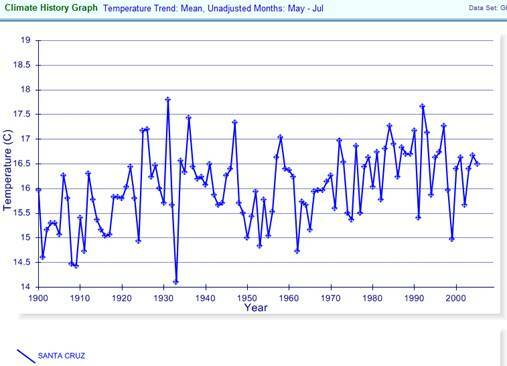 The graph shown below also shows the problem of using data sets starting in 1950 instead of earlier in the century. The coast / inland contrast may be different than in the 1950s – 1960s, but it is similar to the first 40 years of the 20th century.